Wolpertinger (version 0.4 shown above) is an realtime opensource softsynth for linux, created by Johannes Kroll. From the ReadMe file: "Wolpertinger is a subtractive, antialiased software synthesizer. Sound is generated by a Saw/Rect/Triangle wave generator and then filtered through a bandpass filter whose center frequency "bounces" around the frequency of the playing notes." Wolpertinger has a distinct, "formantish" timbre. The parameters available in the GUI require specific attention when modulating, to avoid extremes of pitch; in particular, the resonance setting. 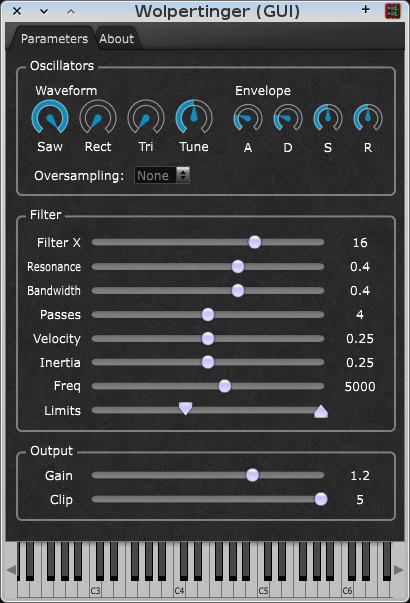 Over-sampling (8x- and 16x-oversampling) is provided as well. The "Inertia" setting determines the amount of "bouncing" around the initial tone. High and low limits can be set to control the Inertia range.